When, as an island nation, you find yourself suddenly cut off, your biggest issue isn't oil or electricity. The issue is food. Humans survived for many thousands of years without oil or electricity, but food is essential. The Soviet Union withdrew its support for Cuba in 1991 and Cuba found itself without the Russian oil, fertilizer, seeds and pesticides that it had become dependant on. They couldn't trade with the US. They were on their own. 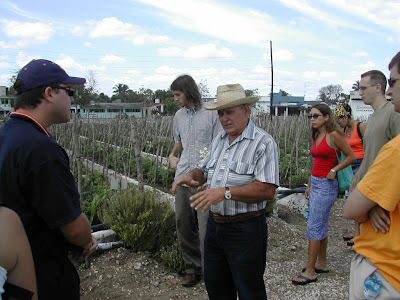 What they realized is that even in Cuba's urban centres, you can still grow your food. They set to work putting gardens basically everywhere, growing all sorts of vegetables. The farms were local and de-facto organic. They simply didn't have access to the pesticides or the fertilizer. Their diet, with an increase in fruits and vegetables, was healthier too. That lesson, has put Cuba at the forefront of urban agriculture, and has given us a window into what we might look forward to. Virtually overnight, they were able to shift from an oil and chemically dependant centralized food supply, to a distributed food supply that was automatically organic, met the needs of the people, and put them at the forefront of a resurgence in urban agriculture. No question it was a shock, but they had the resilience to survive it. Do we? We may get the chance to find out. Expect peak oil. Expect peak food too. The fertilizers we rely on are derived from petrochemicals. Look at your yard. What bounty has your grass given you? Start thinking now about a garden for next year. We would do well to make the mistakes while there's still grocery stores around to bail us out. We've done this before, but we've mostly forgotten how. Victory Gardens helped carry us through WW1 and WW2. We can grow our own food again, and we can shift our food strategy quickly. The shock of the transition will be easier if we start now, rather than waiting for circumstances to force our hand. It's time to grow something, and it'll be tasty.